A weekend bag exists as an invitation, a beckon, to go have some fun and let loose. Just take off with whatever you can fit and go. With that freedom in mind, we designed this bag to be spacey, comfortable, tech-friendly, and fashionable. We took aspects of early to mid-century luggage designs and updated them to meet the demands of modern life for a result that is entirely Pad & Quill, and aptly named Heritage. What you see before you as gorgeous, rich, full-grain leather is what came to you after a long selection process where we sort through and choose only the choicest of hides to work with. The Tannery then takes the natural canvas of those leathers and reveals a beauty that was waiting to be found in our varied leather colors: Whiskey, Galloper Black, and Chestnut. This is where our standby "Artisan over automation" rings the truest, in the hands of the artisans where these leathers transform into something magnificent. We don't trust just anyone to cut and shape the leather, only the skilled and caring professionals that know and value the age-old techniques of craftsmanship. An endevour of true pride. Imagine being 12,000 ft above ground level taking that first weightless step outside of the plane door, trusting that the pack on your will open and will not bust when it does. Why? Because it is made of the right materials. That is why we use parachute-grade nylon stitching that is UV-resistant and super durable. All of our bags and products feature this outstanding stitching. While keeping this all-leather bag fairly light, at 6lbs, we work to make every part of the bag usable space. We have even tucked an external pocket on the outside for quick access. The size of the bag is carry-on bag friendly and has an ergonomically designed shoulder strap as well as large handles so you can switch up the carrying styles as you need to. We back up every bag with 25-year leather warranty and a 30-day money-back promise. 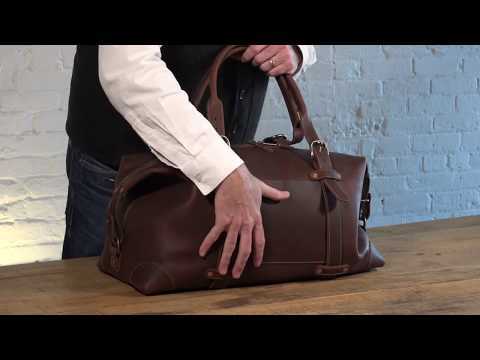 You will love this bag and the travels it takes you on, that is our Pad & Quill promise. Welcome to the family!